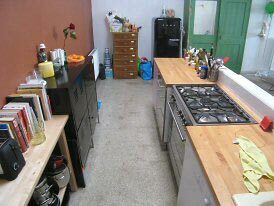 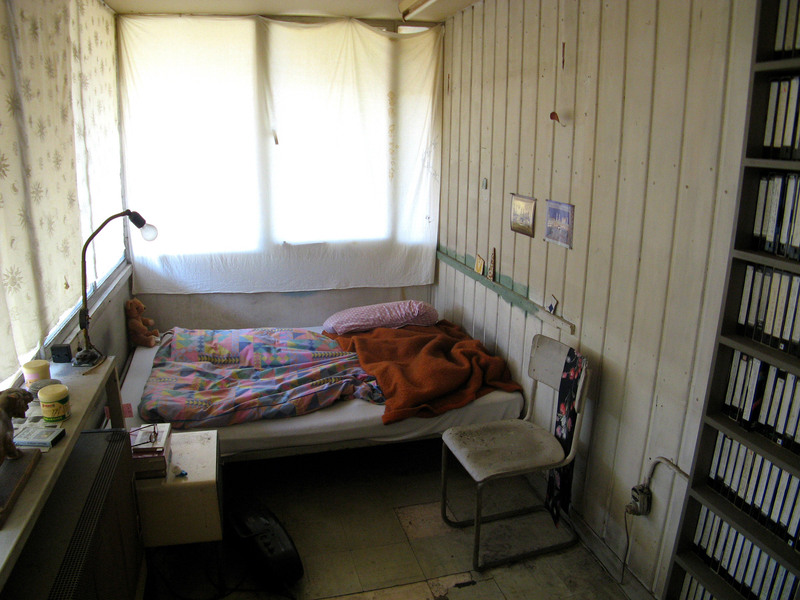 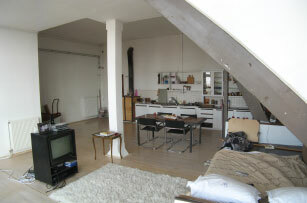 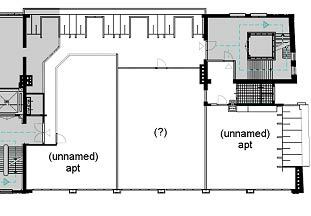 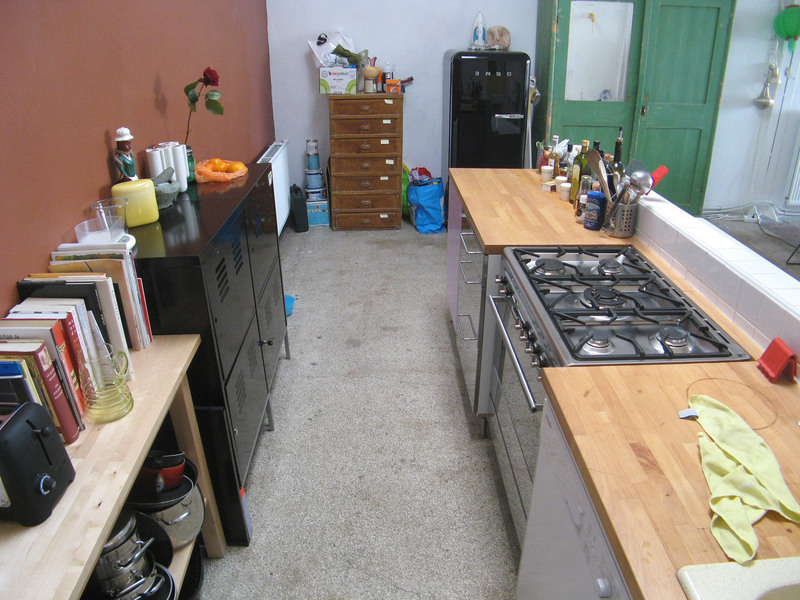 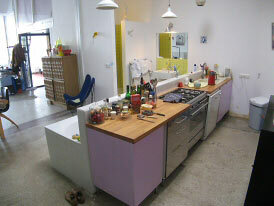 Level 5 consists of both an isolated apt and a locked enclave of only two living-spaces. The independent apt opens only from Dacostakade south-stair's L5 landing. 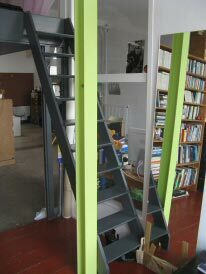 As with all the Hartcamp enclaves, the enclave opens both from Dacostacade's central-stair and its south-stair. 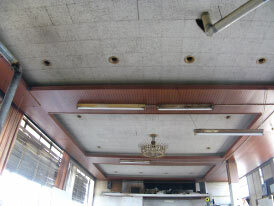 The L5 enclave is unique in that the Dacostakade facade's inward sloping dormered half-roof has apparantly disrupted the convention of a central-passage plan and influenced the plan of spaces. 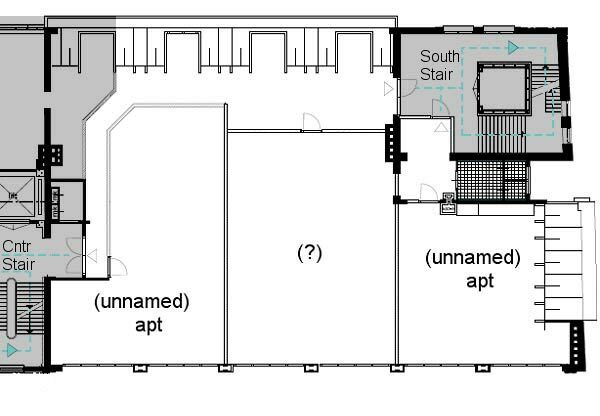 Along the east edge there are only small store areas (associated with the dormer-window bays) and a fringing access corridor serving its two huge living-spaces. In the mid 90s none of these spaces could be photographed and only one visited. 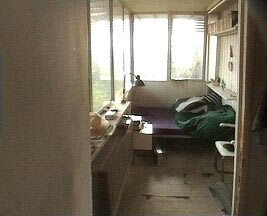 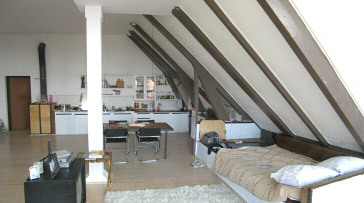 I was unable to visit the north-end living-space until 2008 - it was then a relatively new apt made in 2006. 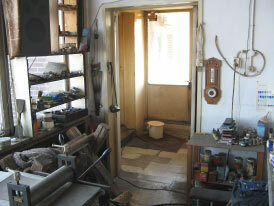 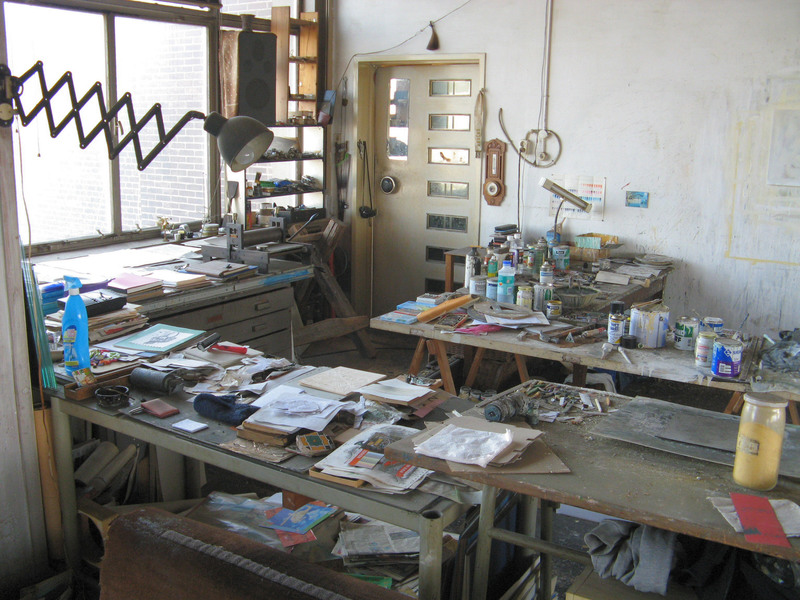 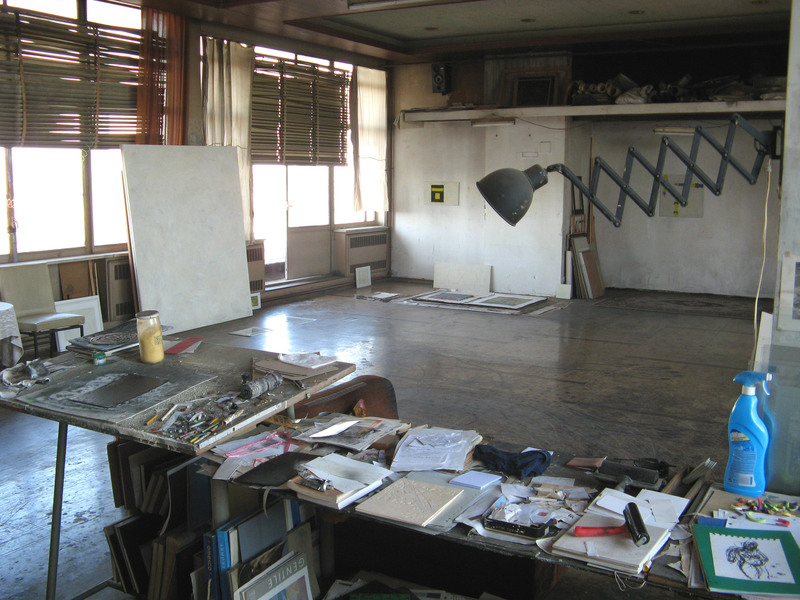 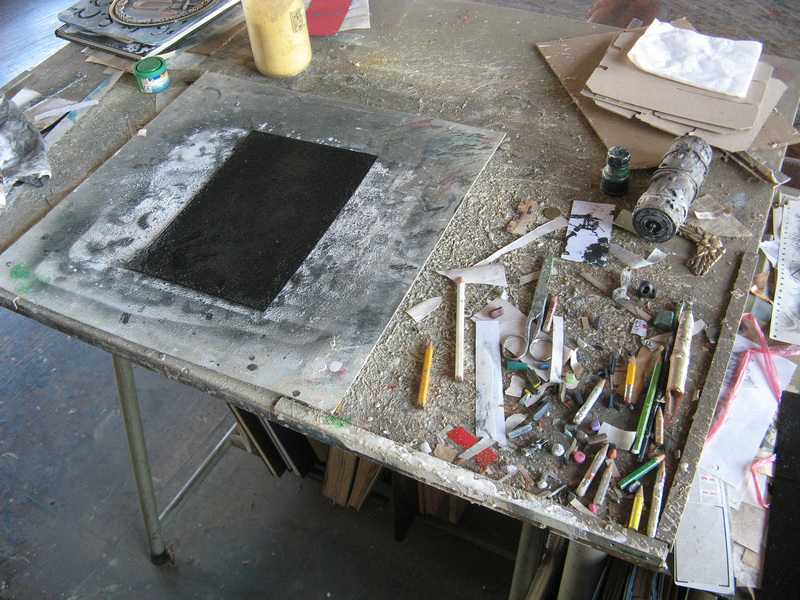 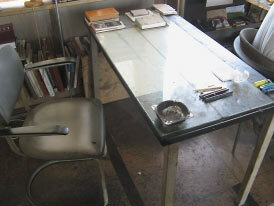 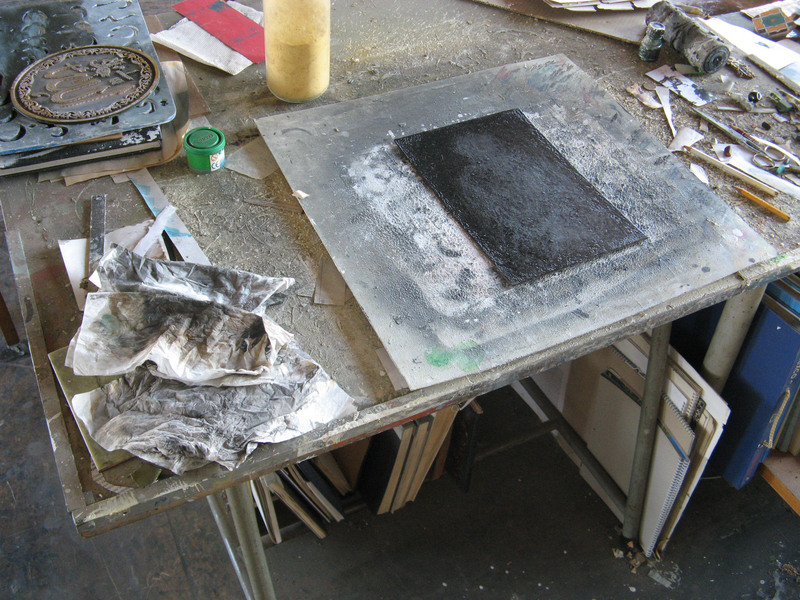 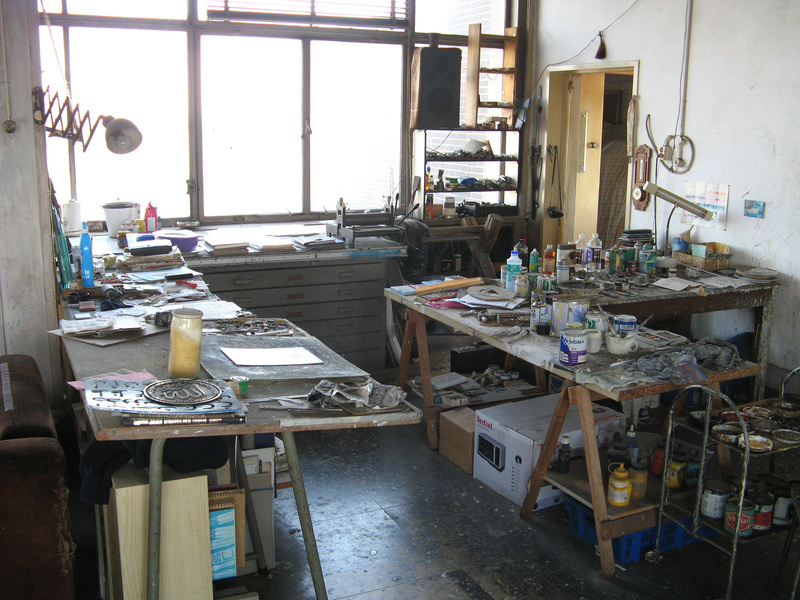 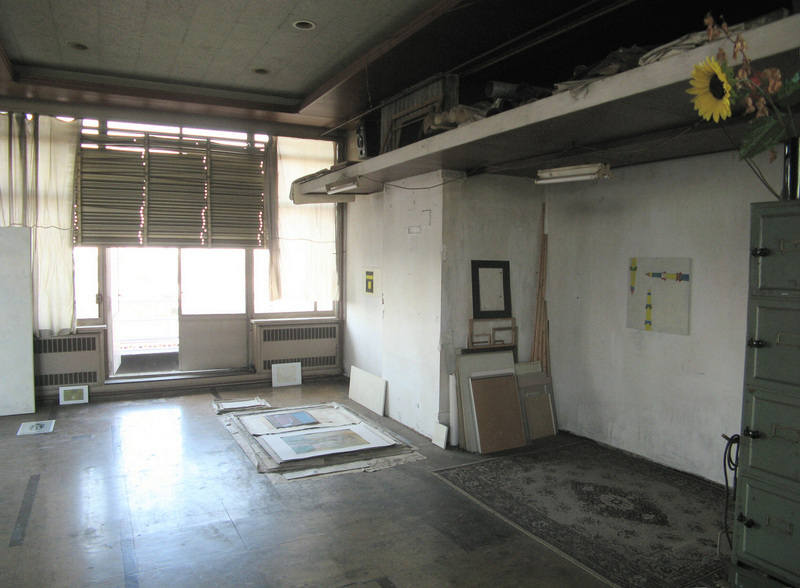 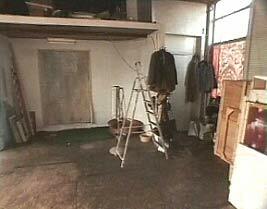 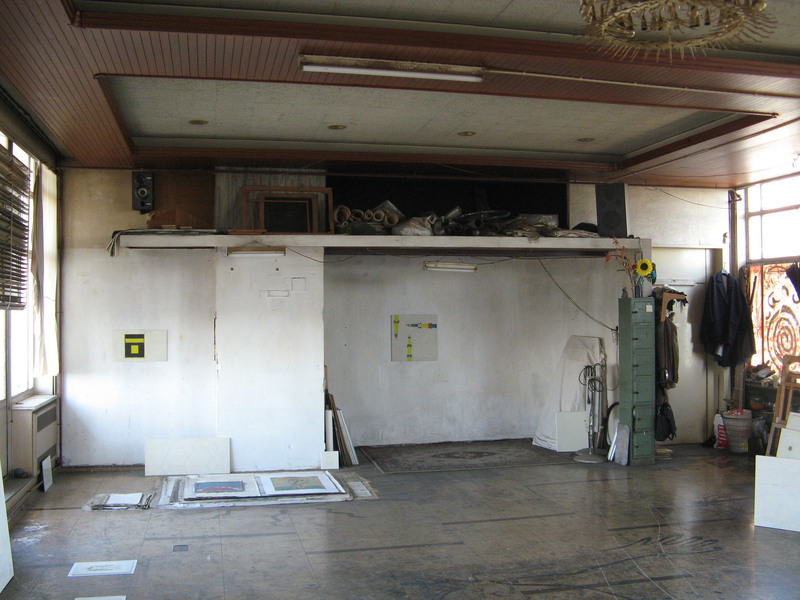 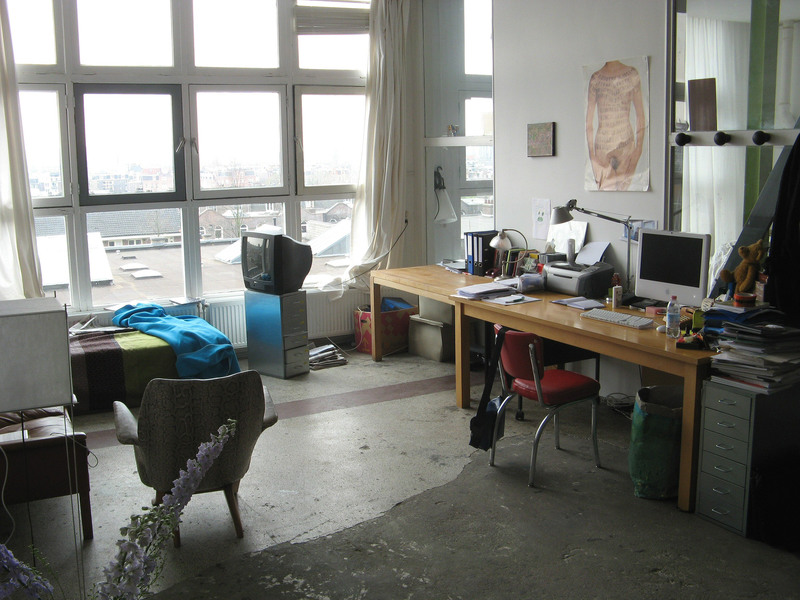 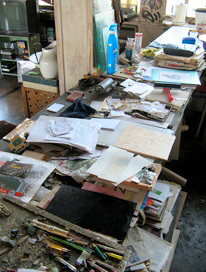 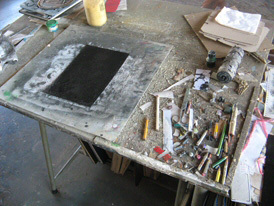 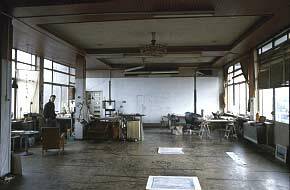 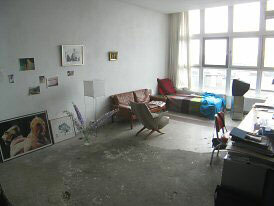 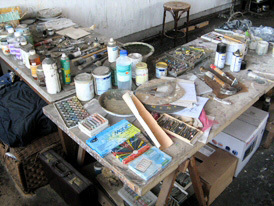 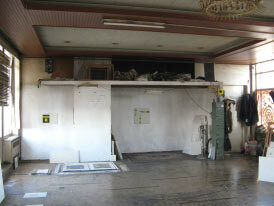 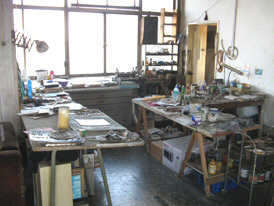 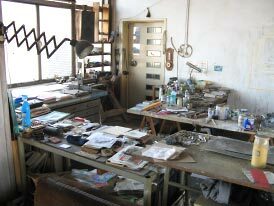 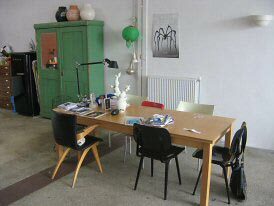 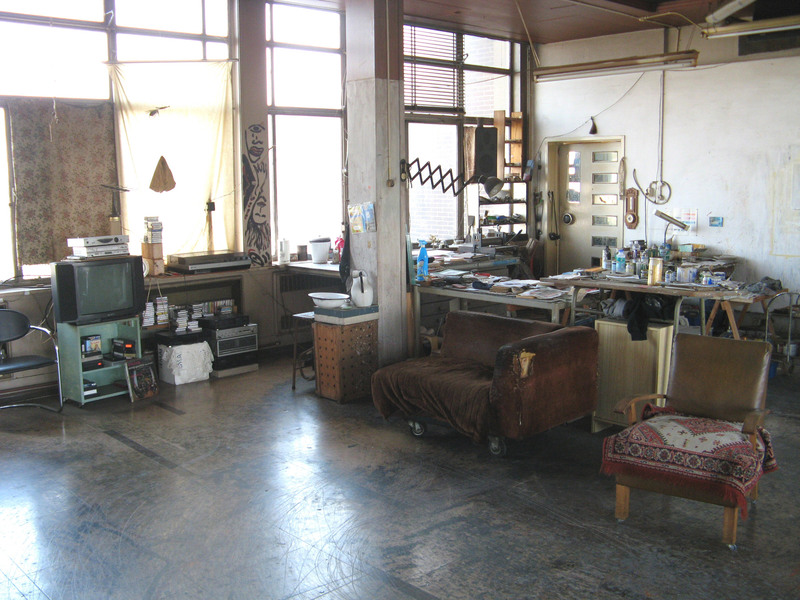 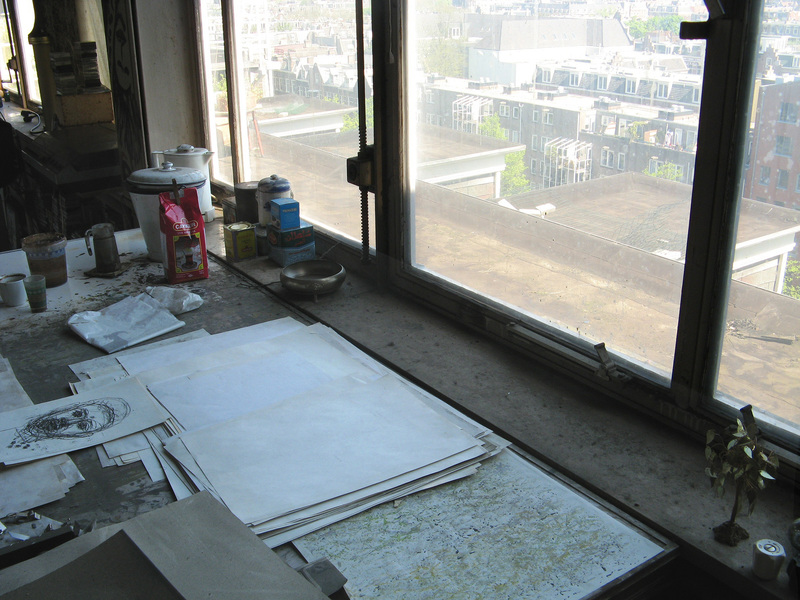 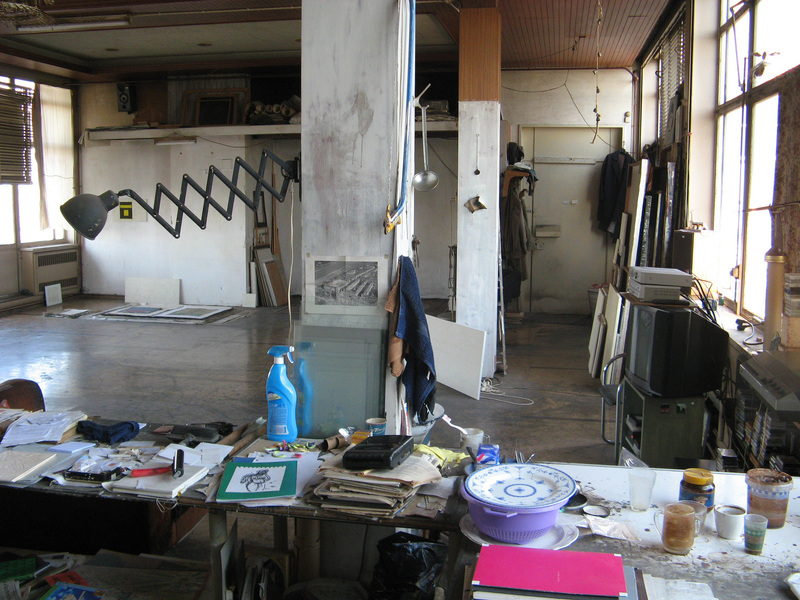 The centre space, which I was only able to visit in late 1993, was a vast studio whose user lived outside Tetterode. 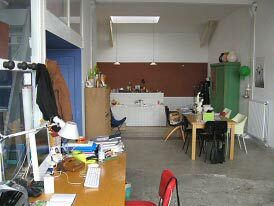 The independent apt at the floor's south end was/is a complete and independent home which I was first able to visit and record in 2008. 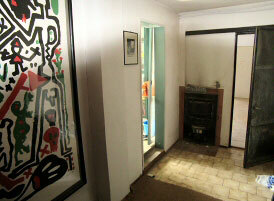 This is a completely self-contained and independent family home. 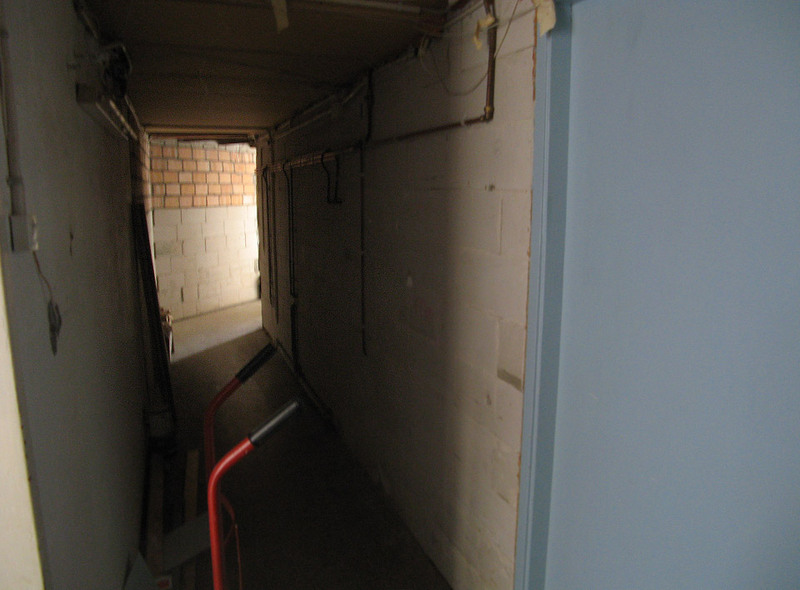 The apartment's entry door is on level-5 landing of the Hartcamp south-stair - this sparsely used, rather bleak stone stair, circling a redundant lift-shaft used for storage, is its sole (and almost private) communication with the street, ten flights below. 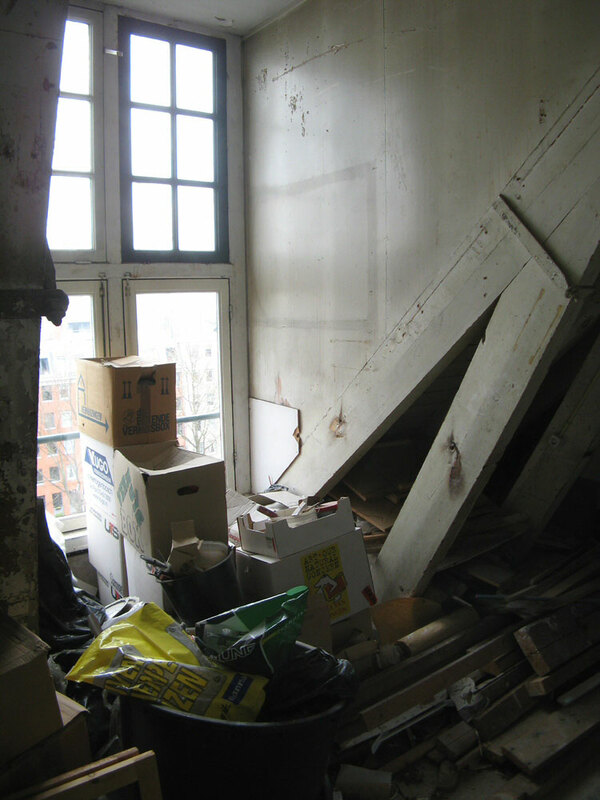 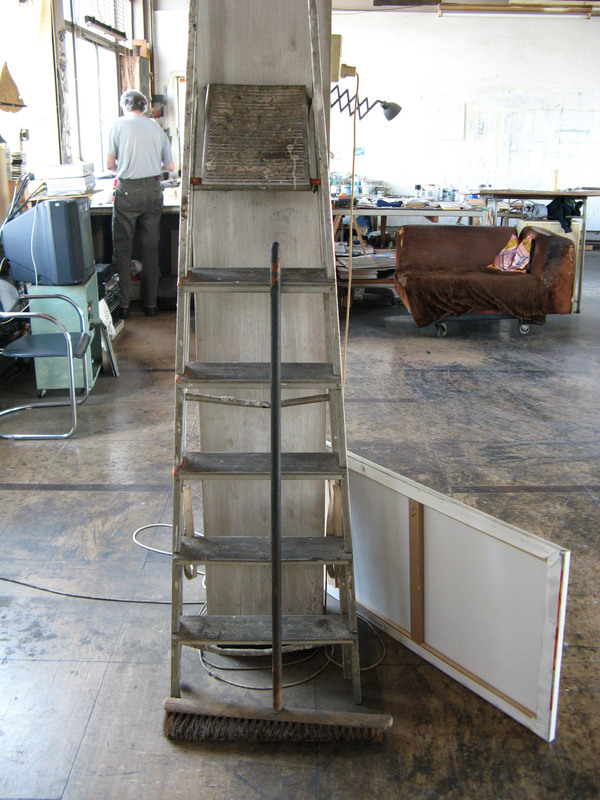 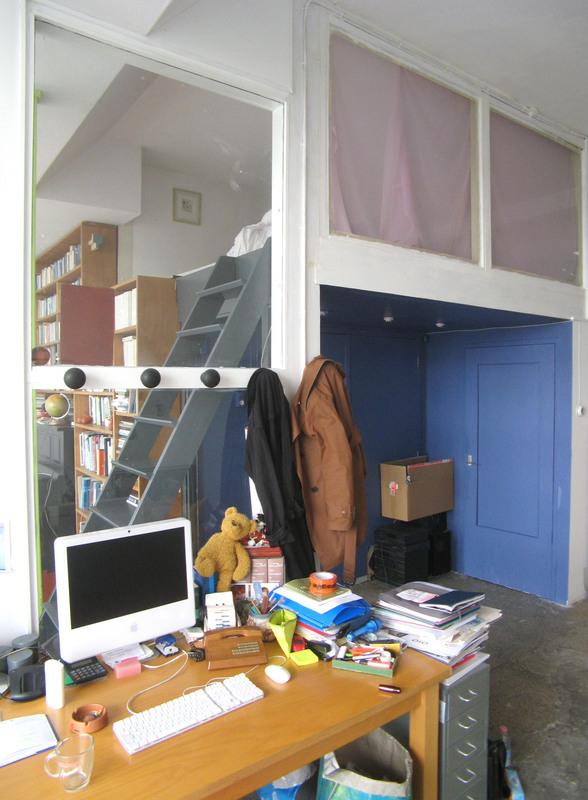 In the mid-90s the apt had climbed this stair and usurped parts of the circulation space on level-6 as semi-private rooms (by 2006 this extended territory had been dismantled - by order of the Collective). 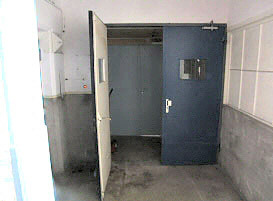 Its 'front-door' opens into a small lobby with the bathroom/wc. 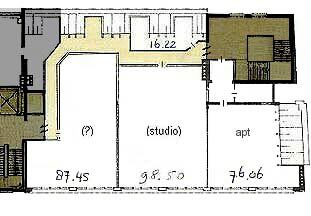 All other domestic needs are accommodated in a single large volume with no differentiation more physical than an open zoning of functions - this main space fills the building's southwest upper corner. 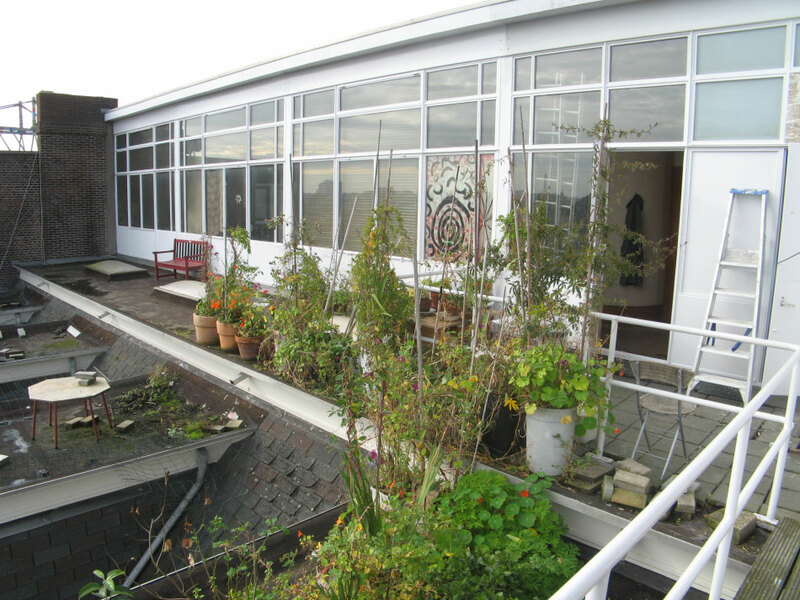 Before Merkelbach added its level-6 'penthouse' this was the topmost level of Hartcamp's 'domestically-styled' 1921 building, which only here retains its sloping roof (a last vestige of its original south-end roof-scape, now invisible from the ground). 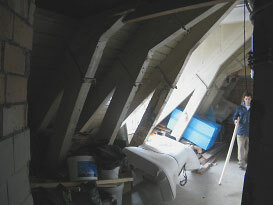 This big almost-square room thus hosts a unique dynamic form, a rhythmical sequence of long sloping rafters that march (out of step) towards the big west window - at the top southern corner of Hartcamp's huge west facade. 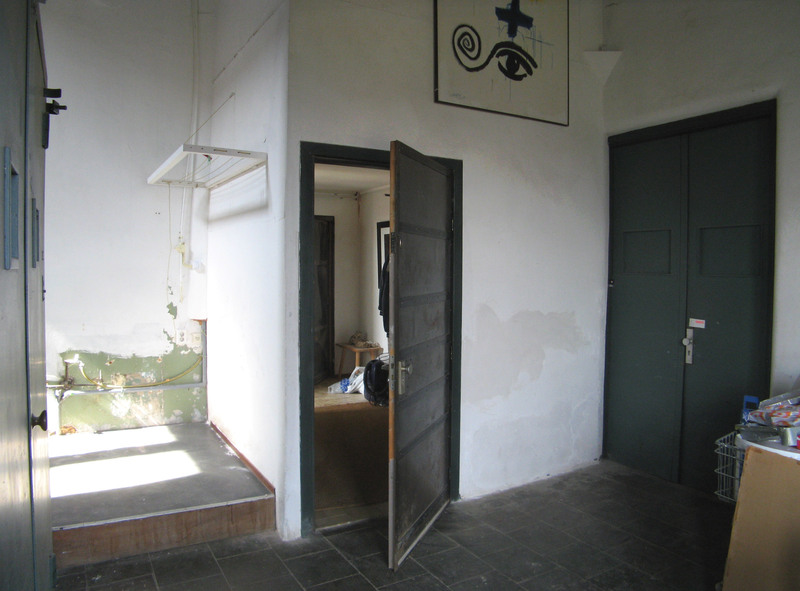 Entry to the lobby and the main living-space ahead. 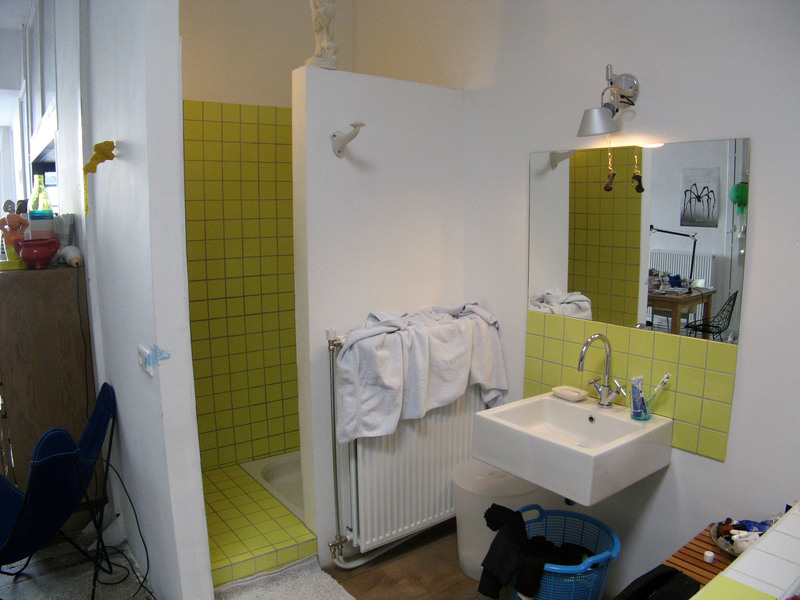 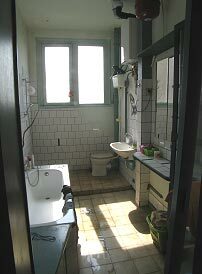 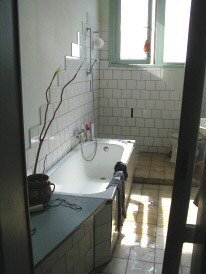 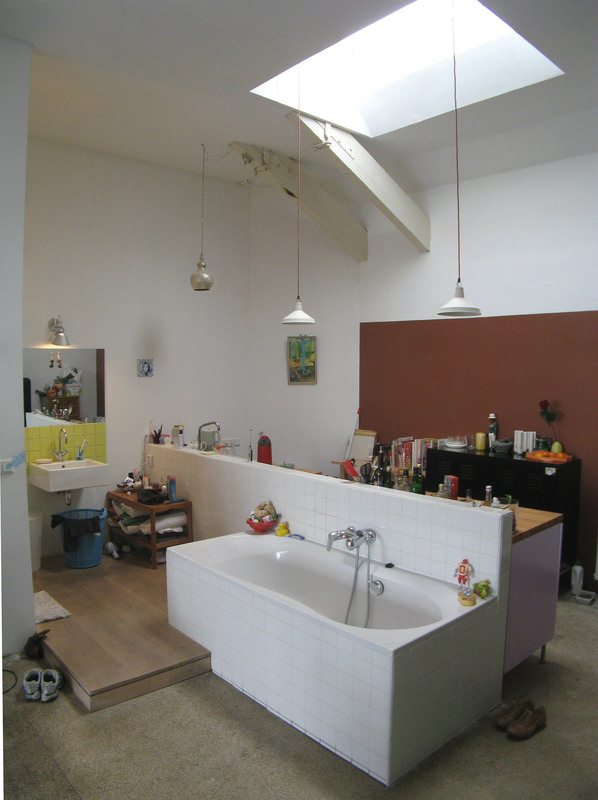 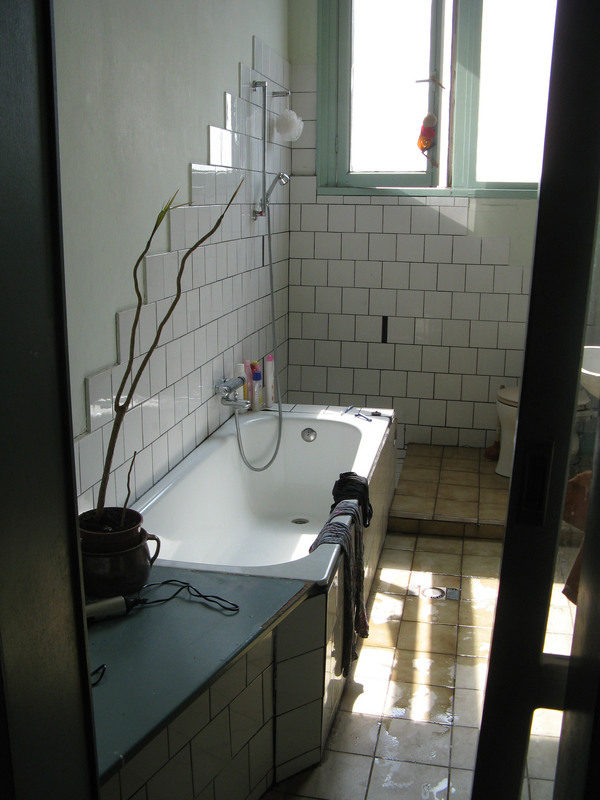 To left is the bathroom/wc; ahead is the living-space. 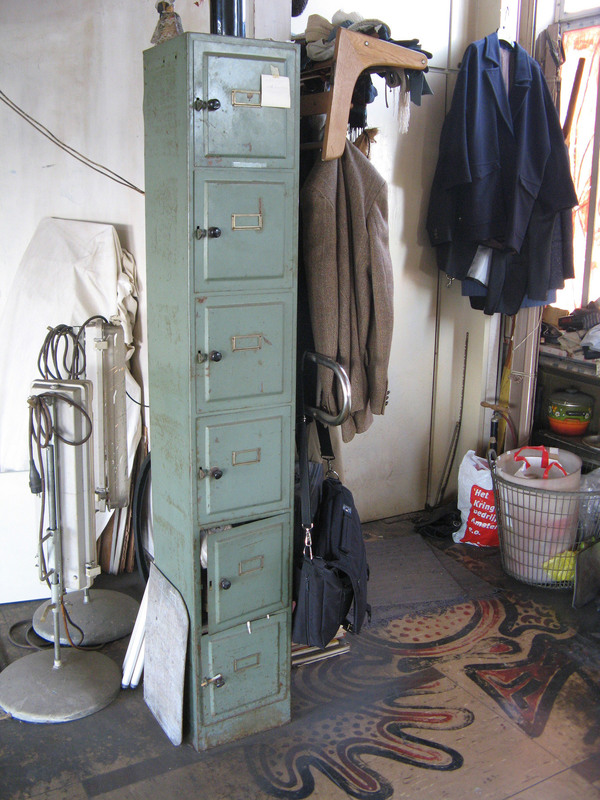 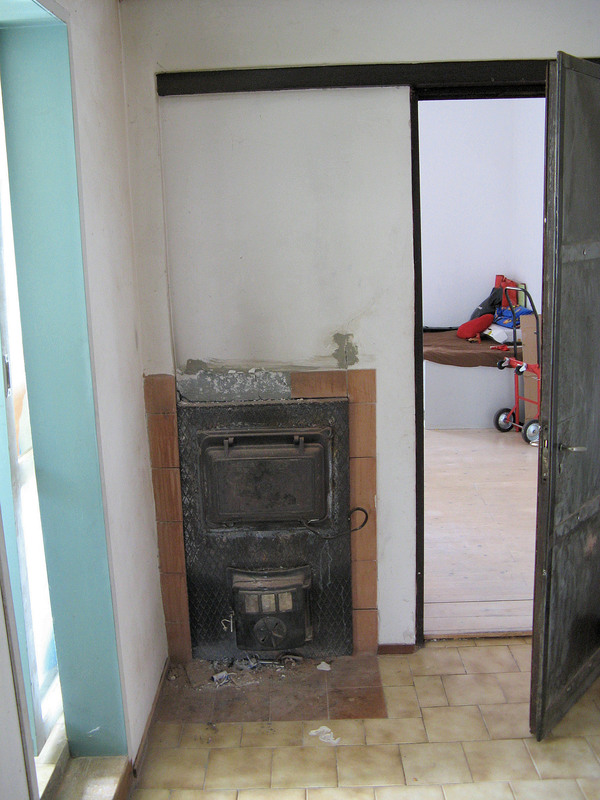 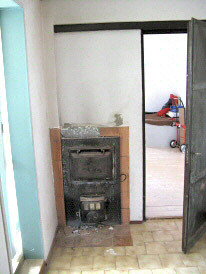 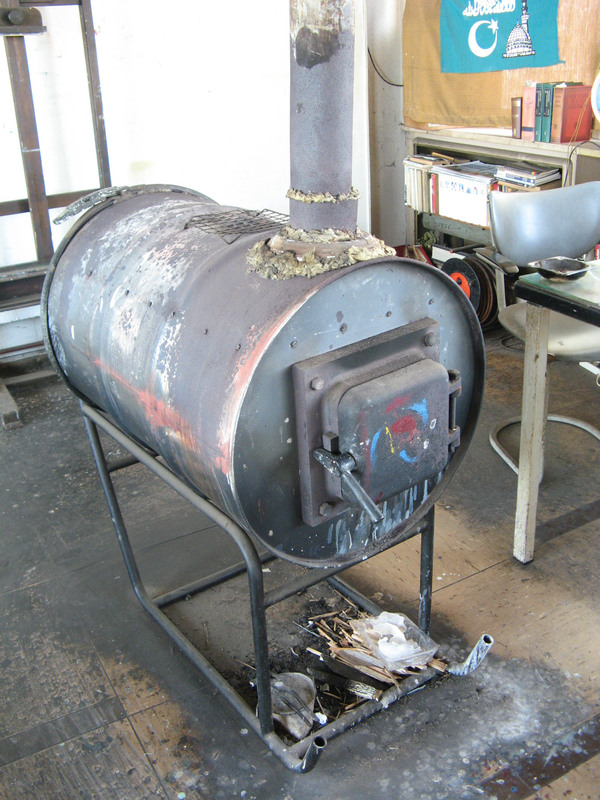 An 'antique' stove seems to have survived from the era of the Tetterode factory (?). The bath/wc room opens from the lobby. 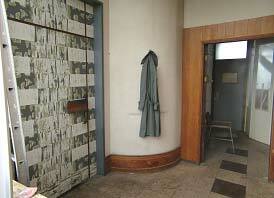 Pic left is the living-space entry door from the lobby. 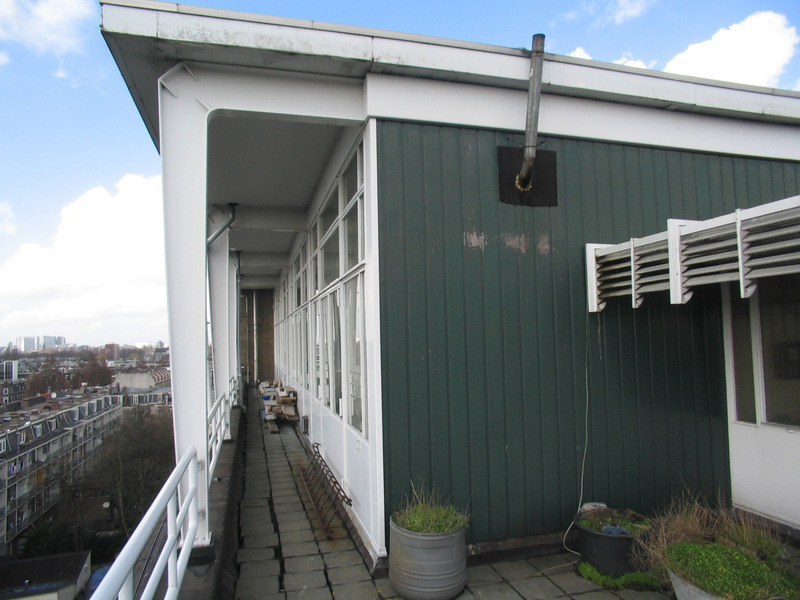 This Hartcamp level-5 enclave is unique, its domain is essentially a loft-space: its narrowing by Hartcamp's 'historicist' dormer-windowed east roof had 2 consequences: firstly it enabled only a single line of apts (albeit abnormally large and only two), both on its west inner side - presumably preferring the big windows and vertical wall of the west facade over the narrow shadow-casting dormers set in the dauntingly complex sloping roof-structure of the east, and secondly this apt arrangement forced the adoption of an unusually long and tortuous enclave passage ... not only is the floor's entry-door set further west than any other but in order to reach the east side the enclave passage has to travel the whole width of the floor, skirting the long side of the unusually wide first apt. The enclave entry door from the dc centre-stair landing opens into a passage that skirts the enclave's west-side living-spaces. 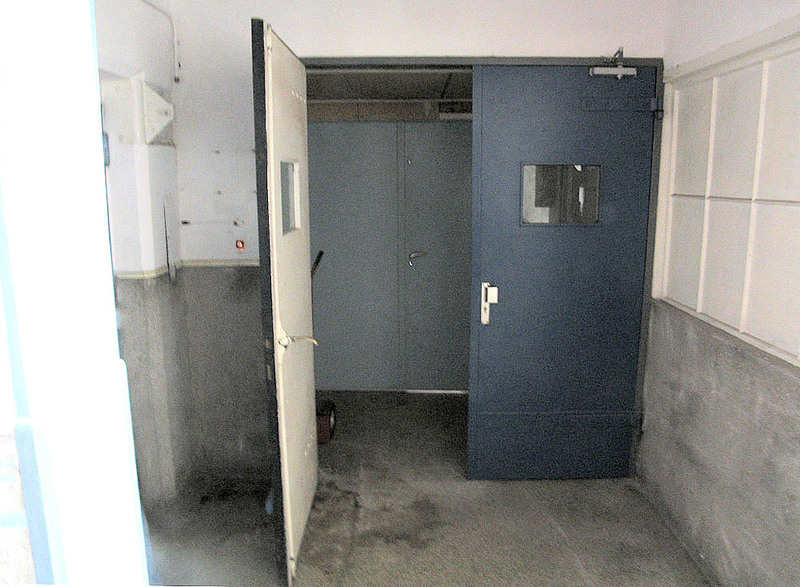 Just inside the enclave entrance is the entry-door of the first of these [pic right] (an apt only recorded in 2008). Along the building's east edge the enclave passage is tucked beneath the dormered roof. 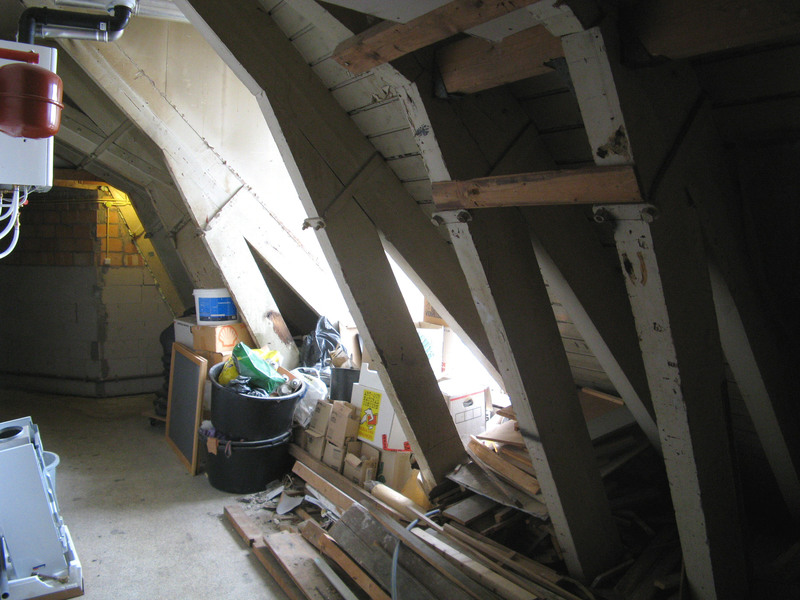 The dormer window embrasures are used by the enclave occupants for storage. At this time building maintenance is in process. 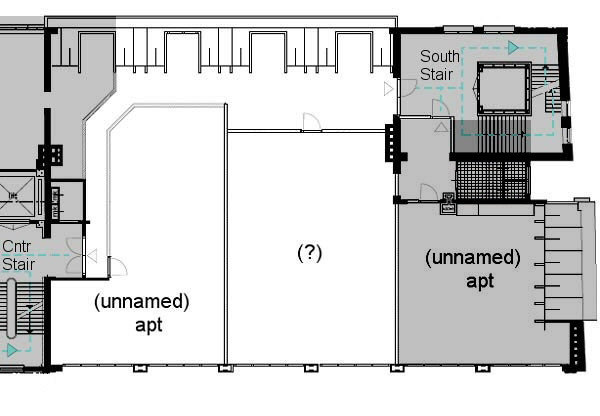 Only one of the enclave apts has been recorded. 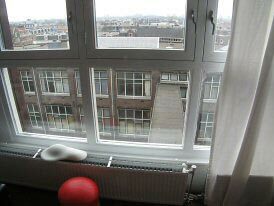 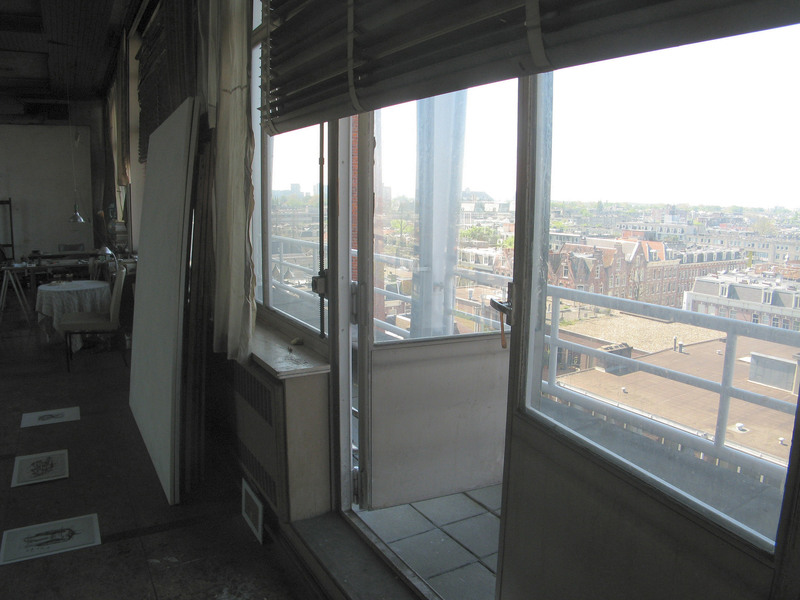 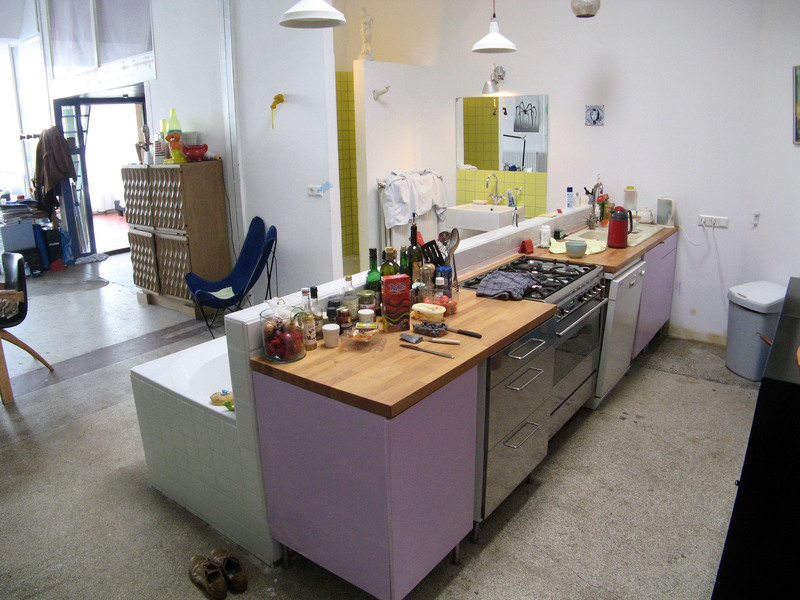 This present apt was designed/made by its occupant and Radboud [Ref: hc4] in 2006. 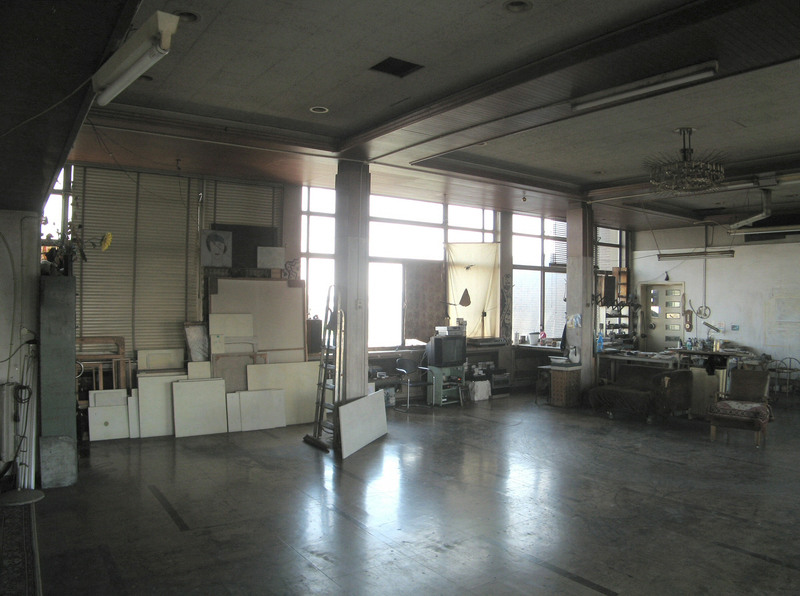 An almost completely open single L-shaped volume containing a marvellously rich collection of disparate and conjoined motifs, equipment, collected and invented objects, inherent features of the building (the 'damaged' concrete floor), only partially-enclosing screens, rich colours. 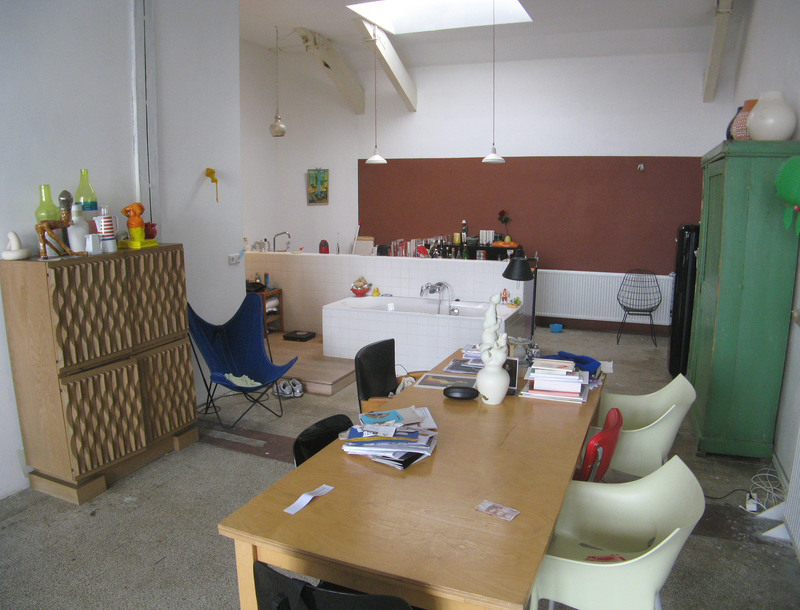 Almost all the contents of this extraordinary apt, from tiny objects up to the scale of large equipment serving primary living-functions (such as bath, stove, bed) are mutually on show to each other, or at least never completely/hardly separated. 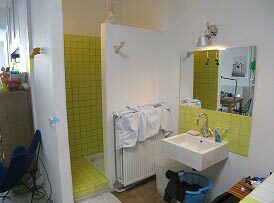 A feeling of convenience and freedom of use and relaxation is one of the results of this continuous interchange of differences and open availability for needs. 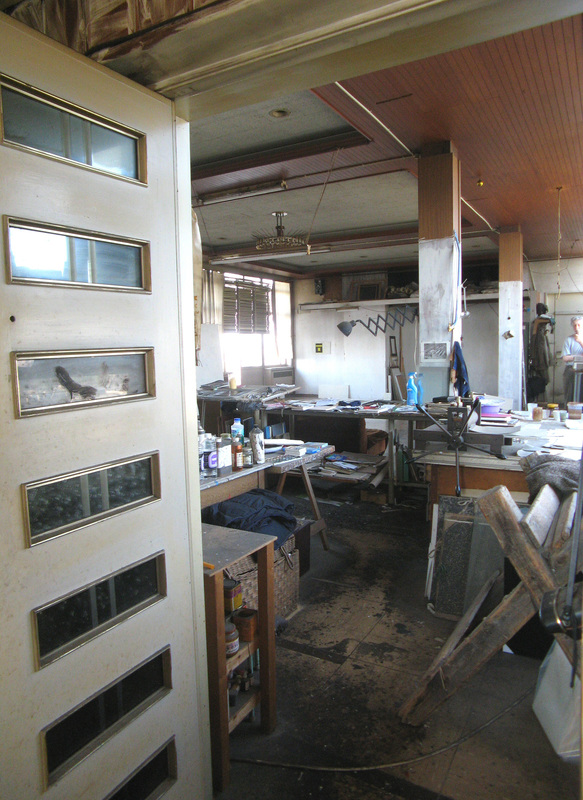 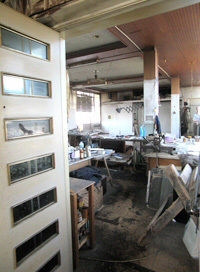 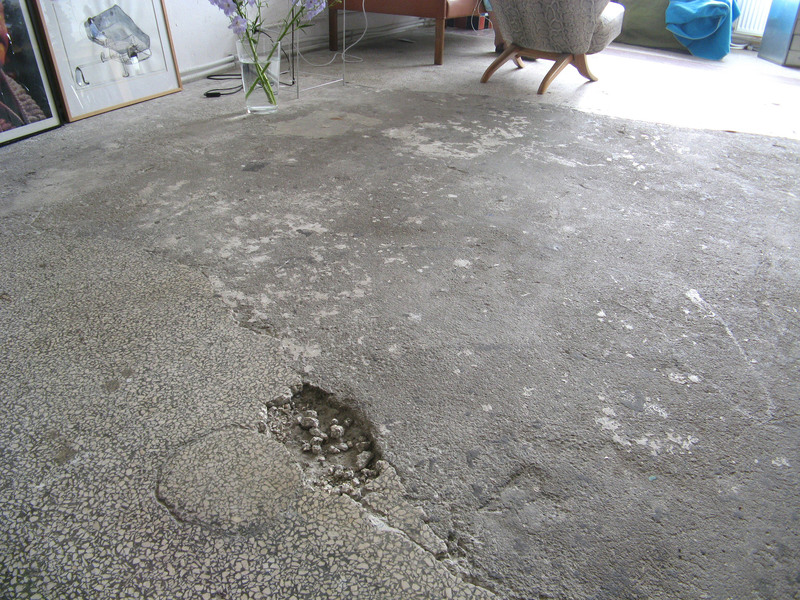 A damaged portion of the original factory floor retained as a 'sculptural event'. 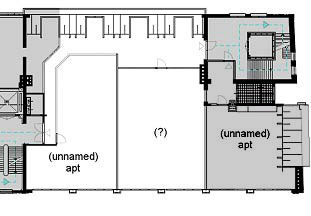 (UNNAMED) APT: BEDROOM - ENTRY FROM MAIN LIVING-SPACE, PLATFORM-STAIR, MIRROR. There are two routes to this ultimate Hartcamp destination. 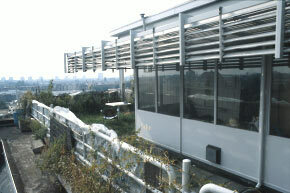 The first is up the centre stair to its topmost L6 landing, which offers three choices: to exit a door onto the external north-east terrace and the gangway of Merkelbach's 'penthouse' apts; to turn immediately right into the tiny steel lobby of a spiral stair up to the L7 'look-out' room (a pause on the climb to Dacostakade's ultimate roof); or ignore these and choose a door between them: the 'front-door' of Frank April's huge studio-apt in the south 'penthouse', added by Merkelbach in 1963 as the Tetterode directors' dining and conference room. 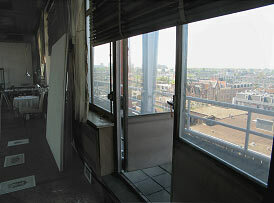 The other route is up Hartcamp's south-east stair to its topmost L6 landing; there, by negotiating a confusing doored passage (apparently semi-domesticated), one finds an exit onto an exterior terrace which extends around the south and west sides of Frank's 'penthouse' - past his 'back-door', glass bedroom, and his studio's west windows. 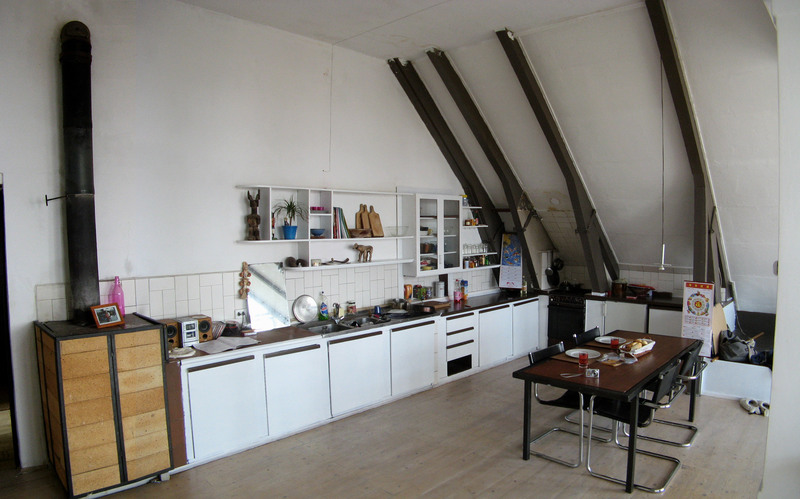 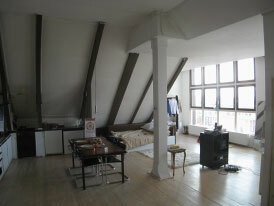 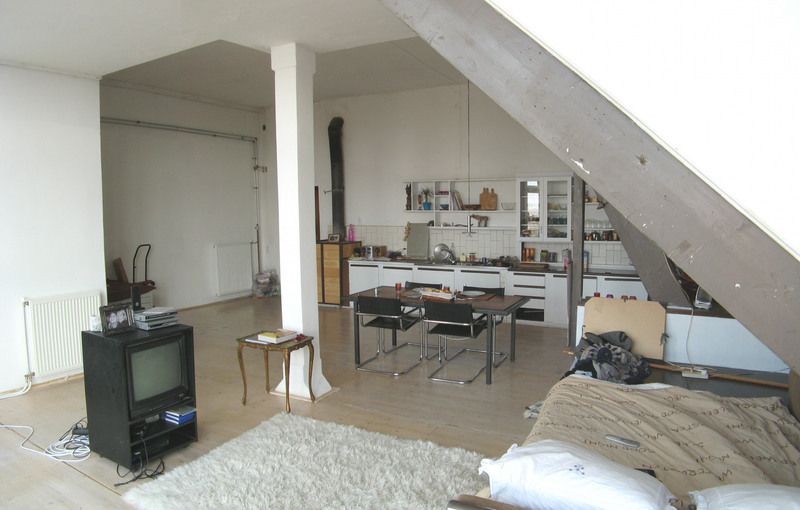 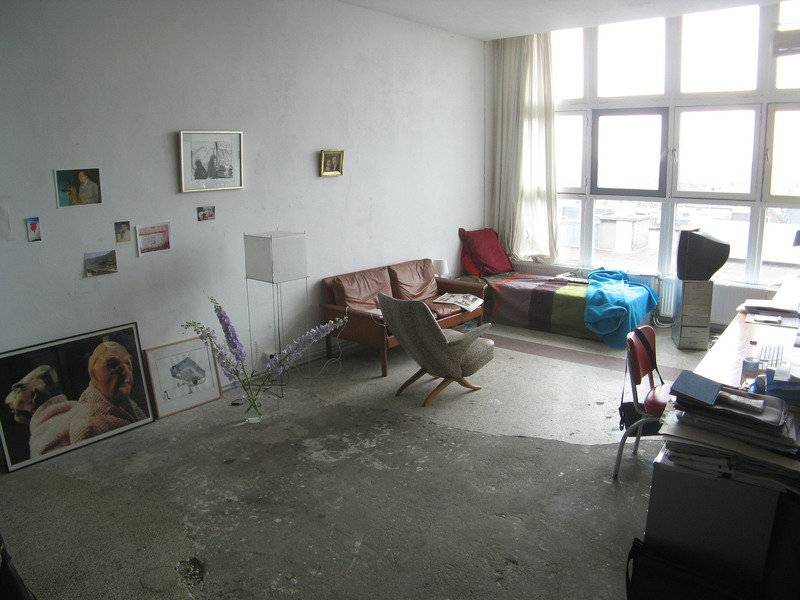 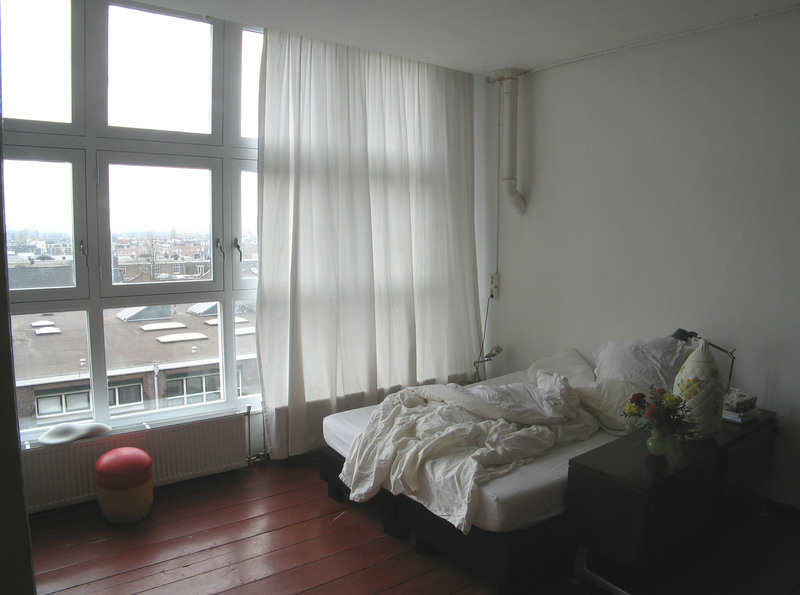 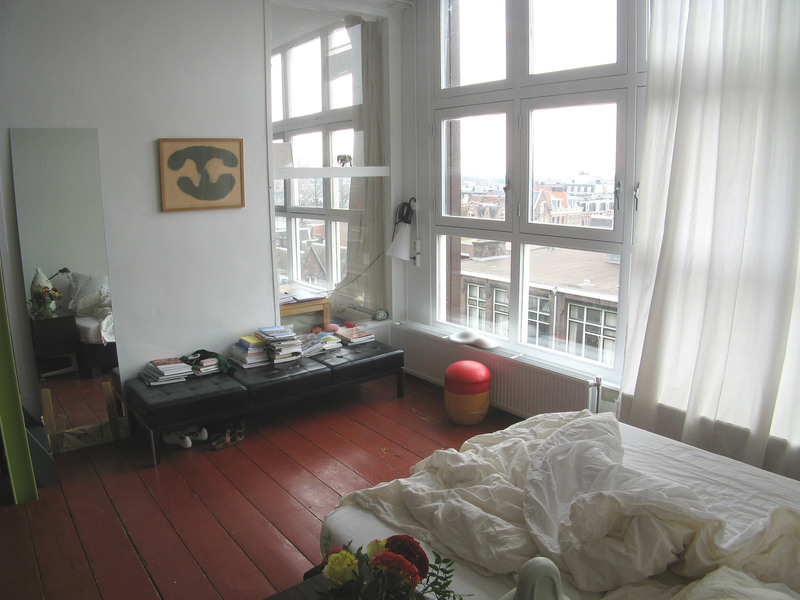 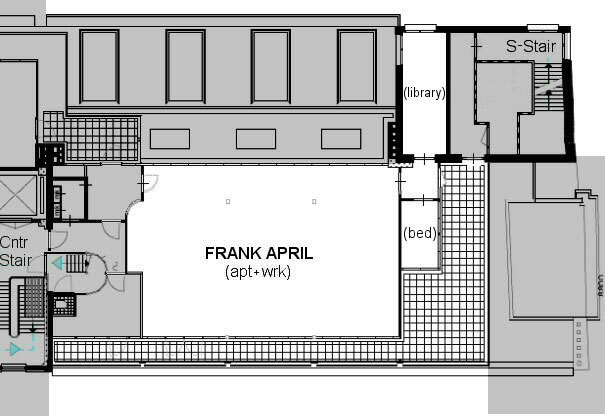 Frank's living-space is the whole volume of Hartcamp's Merkelbach 'penthouse'. 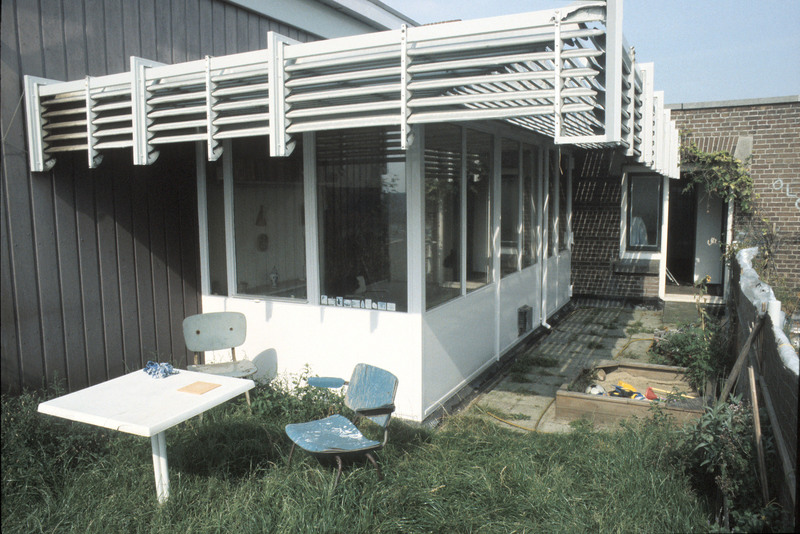 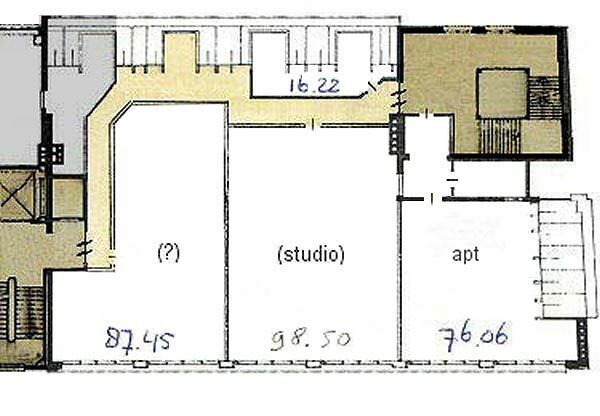 It is mainly studio with a small extension bedroom projecting at the south end - a glass room with an exit to the terrace lawn and garden (the latter open to anyone with access to Hartcamp's southeast stair). This is a very unusual living-place, unlike any other I've seen in Tetterode. 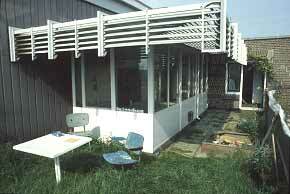 Its location surmounts the whole site and it conveys a sense of isolation from the community. 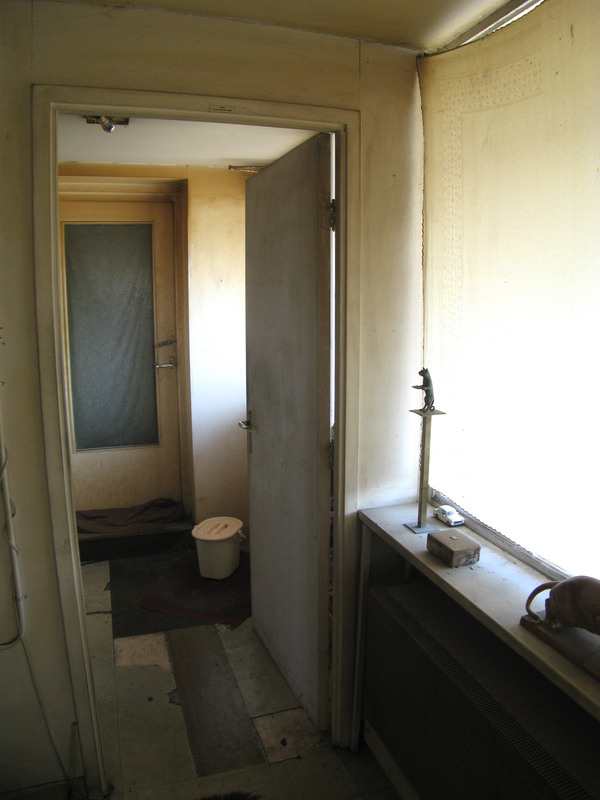 Frank has lived in it from 1981, and in during the 15 years between my visits (1993 and 2008) nothing but details have changed, and these seem entirely motivated by working practicality (an added work-surface; different cans of paint; sealant round the stove chimney), further that in those years there is no apparant increase in desire for 'home comforts' or 'home improvements' (witness the sit-place sofa and the tattered window blinds that have probably never moved). 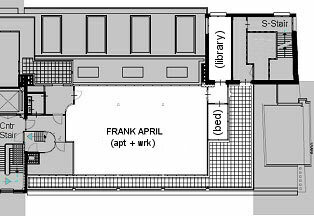 I feel fairly certain that little has changed over the whole 27 years of Frank's tenure here. 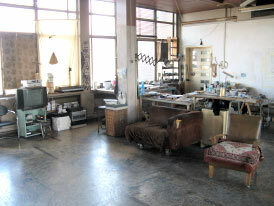 Not only the stasis but also the austerity is probably (now) unique in Tetterode - in fact they are presumably a function of each other in the sense that the whole apt is a 'fossil' of the time when artists squatted Tetterode (especially Merkelbach) primarily for studio-work space. 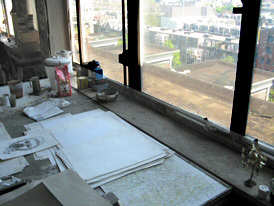 On Hartcamp's SW terrace facing the L6 penthouse glazed extension that is Frank April's bedroom. At the far end of a paved area is a door that accesses Hartcamp's SE stair, beside it on its left is Frank's south entry door. [The terrace is accessible to all Hartcamp residents and at this time its main portion was a garden with a grass lawn - I don't know who made this]. Like its east side the whole length of the west wall of Frank's studio is glazed. 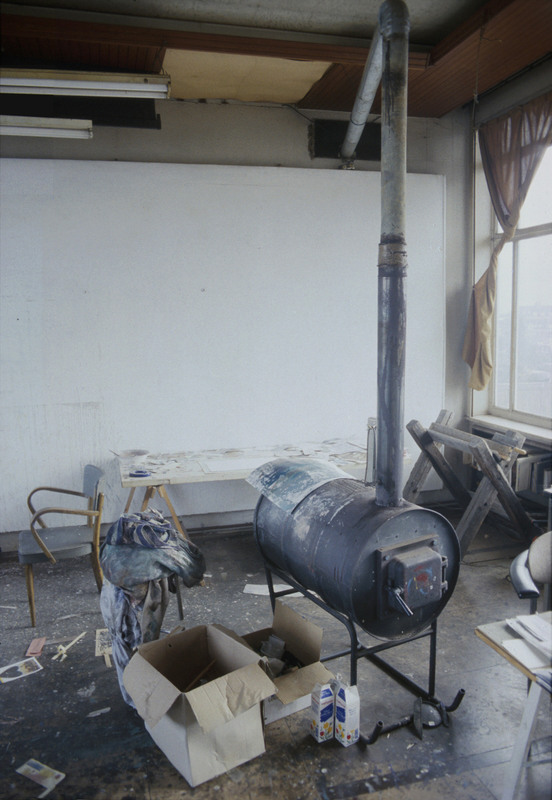 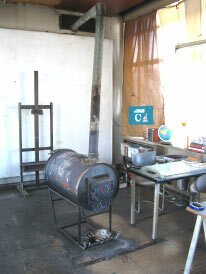 Its stove's chimney pipe emerges through the building's south wall. 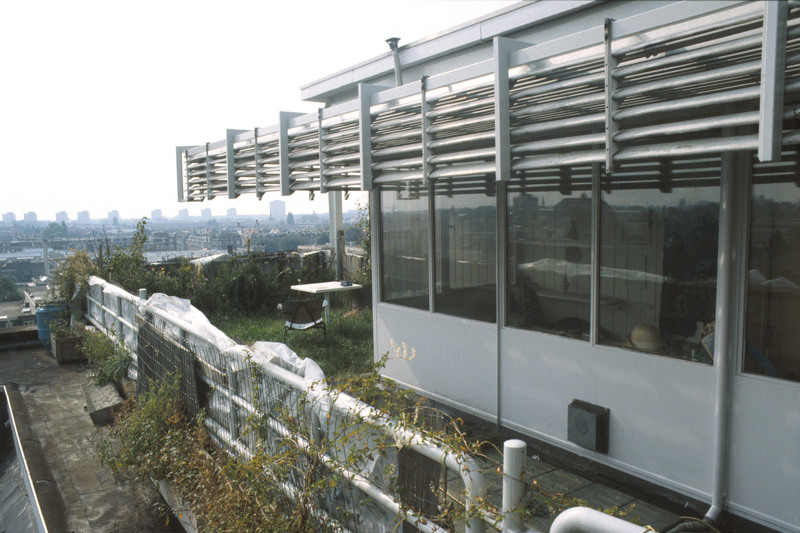 The east facade of Frank's penthouse seen from Merkelbach's NE-terrace. 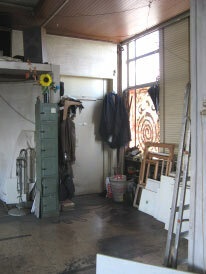 The three large windows are Frank's studio. 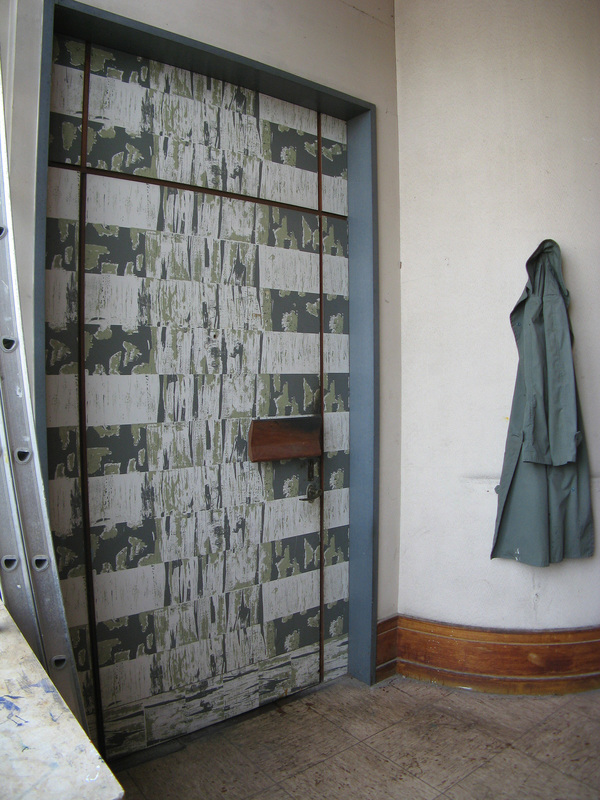 Inside the open terrace door is the lobby of the erstwhile Directors' dining-room, whose entry is now Frank's 'front-door'. 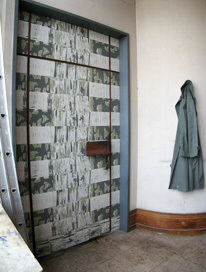 Frank's 'front-door' in its lobby off the centre stair's L6 landing. 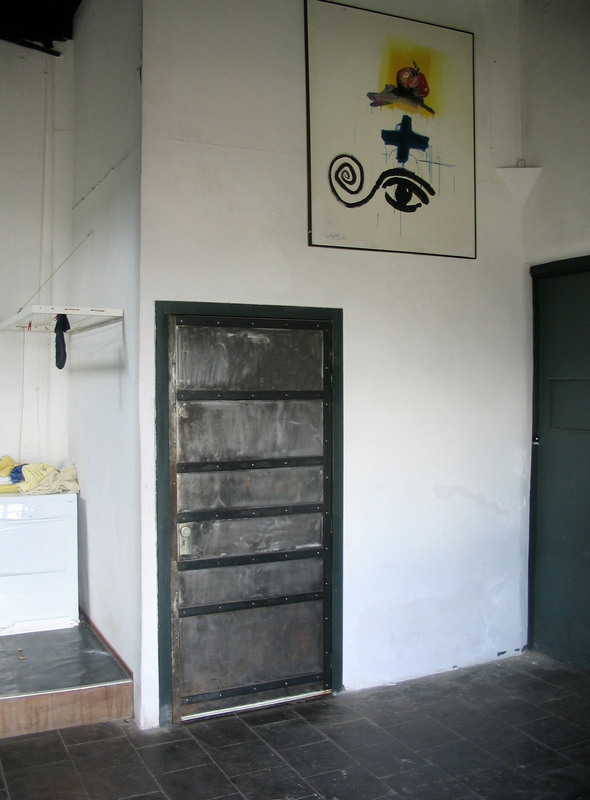 Frank's N door. Once the door of the directors' dining-room - this is presumably still the original 1963 design. 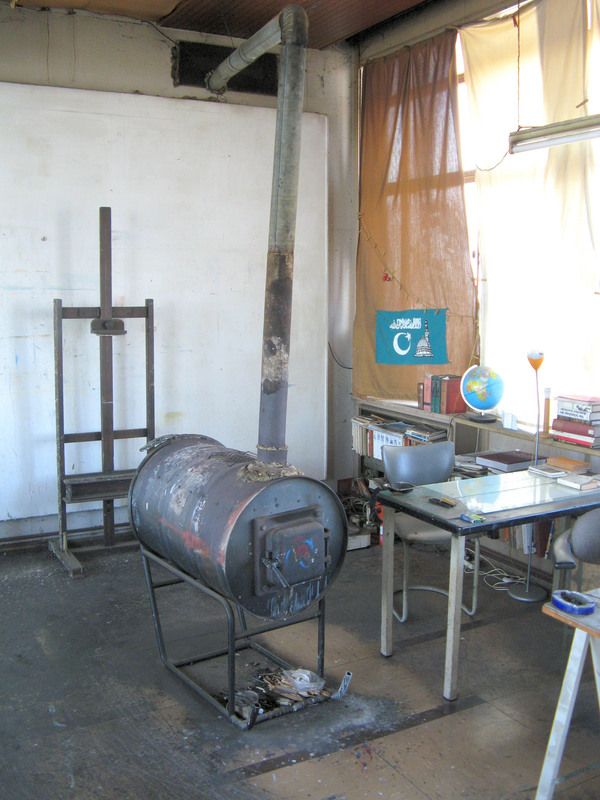 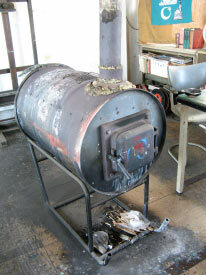 An oil-drum stove - relic of the early phase of the Tetterode occupation and the last of its type. Looking back into the studio from the S-entry lobby. 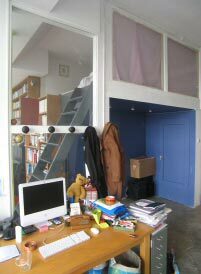 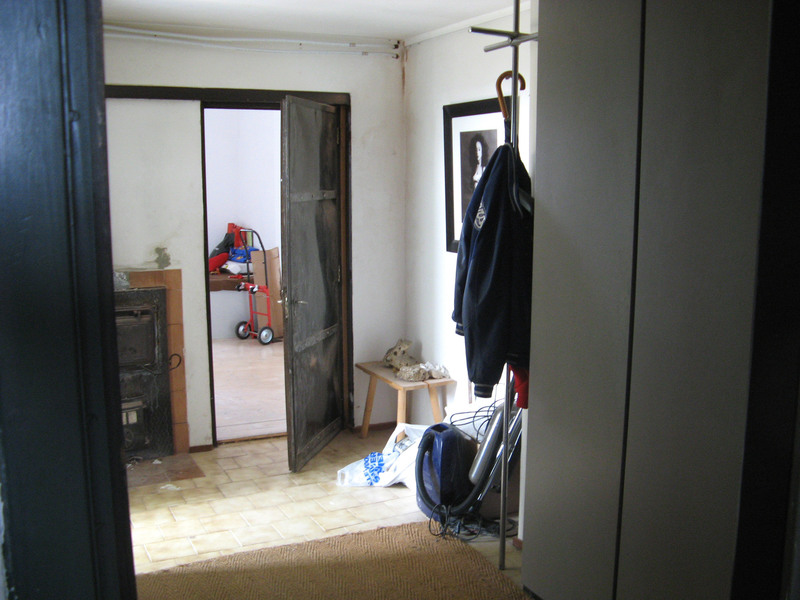 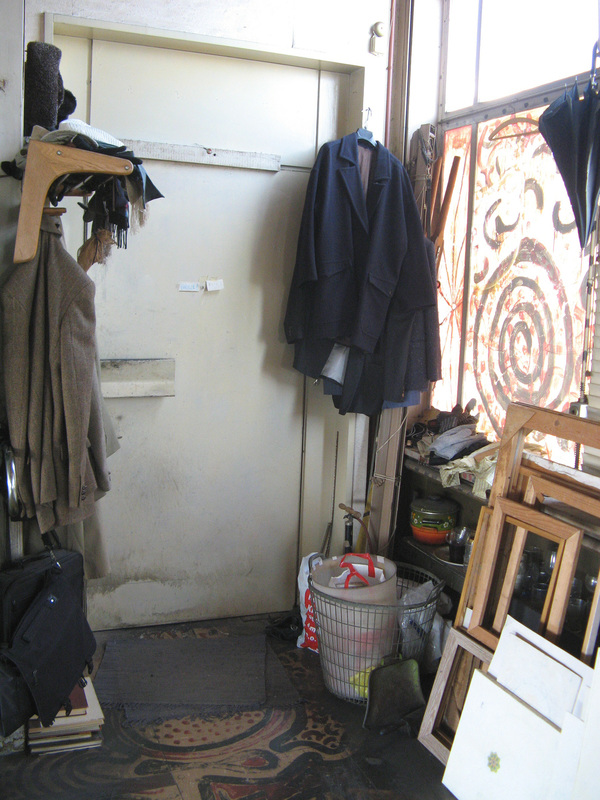 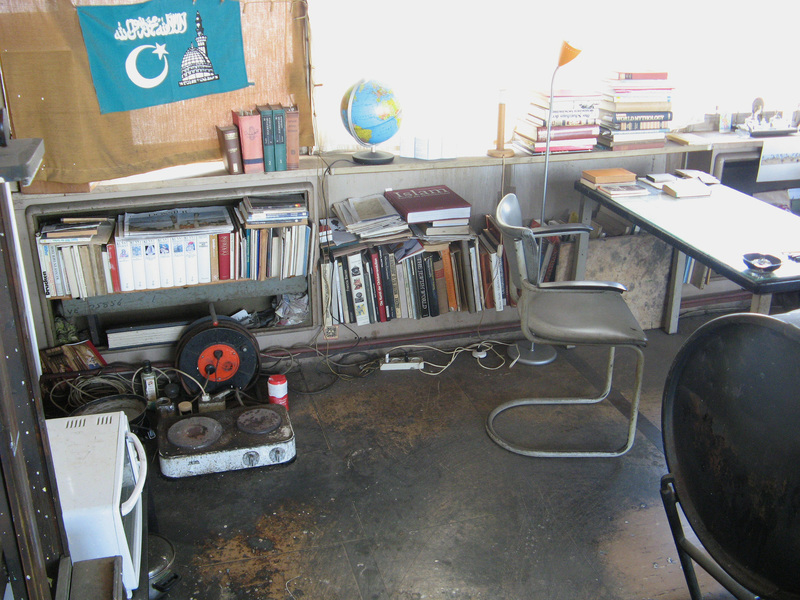 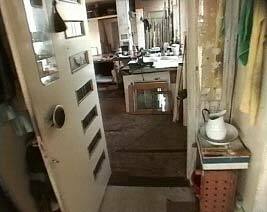 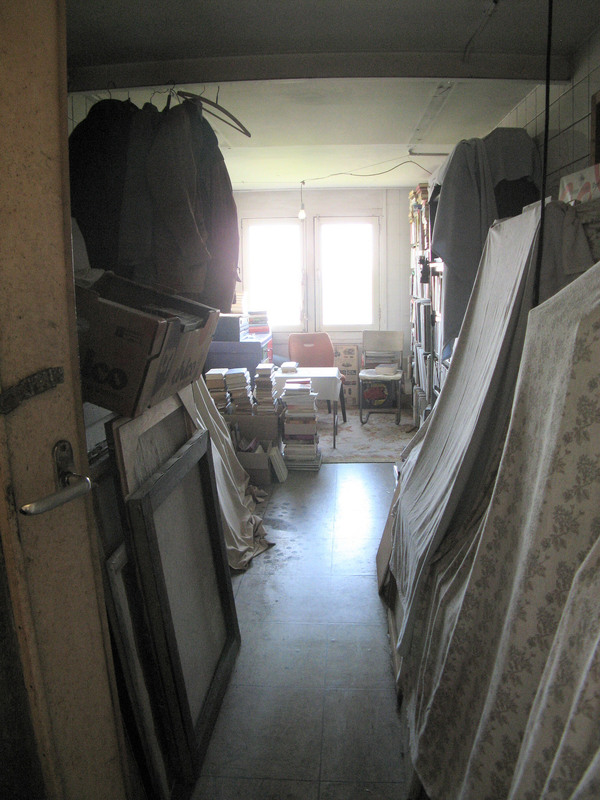 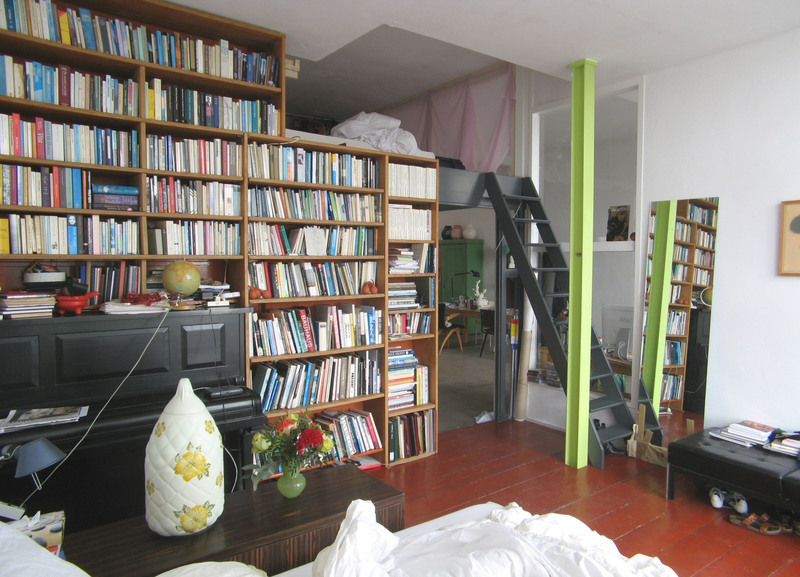 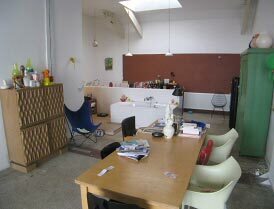 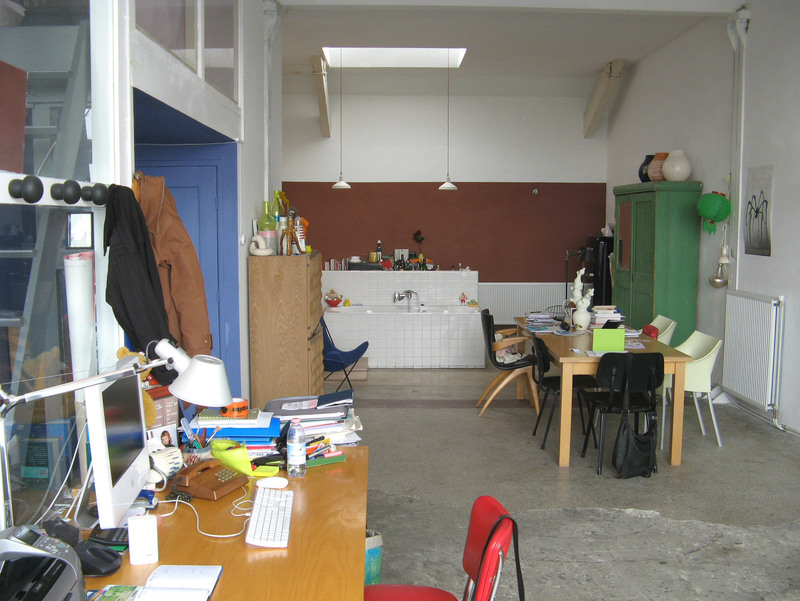 This small lobby serves four doors: the exit to the SW- terrace; Frank's main studio/apt space; his small glass bedroom; his narrow 'library' and store room [see next section '2008']. 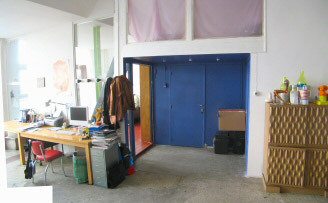 The south entry lobby viewed through the open studio door - on the left is the yellow door of Frank's 'library' and store room [see next section '2008']. 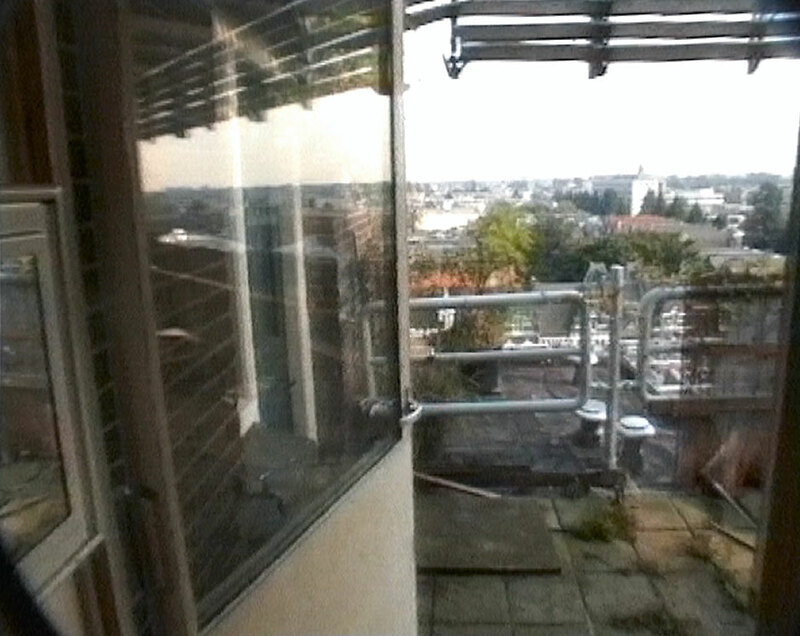 Exiting onto the SW-terrace through Frank's 'back-door'. Looking into the bedroom from the S-entry lobby. 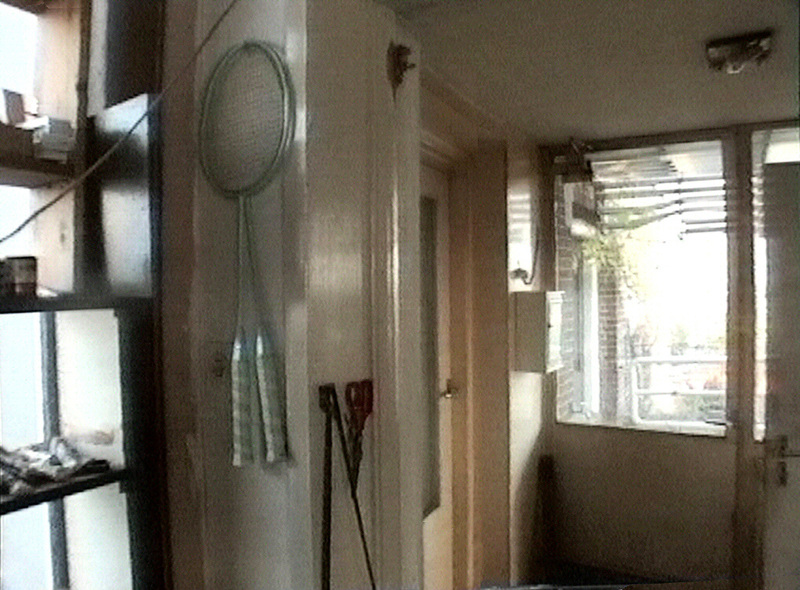 Fifteen years later the same fabric shields the window by the door. The ceiling of the erstwhile Tetterode directors restaurant - probably basically original, but now strangely defaced with ad hoc neon tubes, cables, and a chimney pipe. 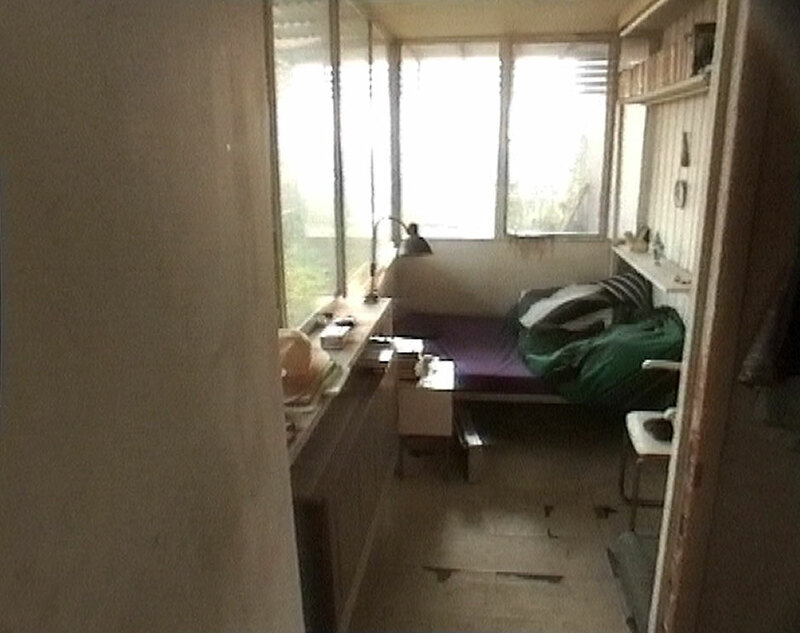 Before the 1986 revisions this narrow space was part of the top landing of Hartcamp's SE-stair.